Tell me a little about your schools and your role. I am a second generation taekwondo master. My father, Grandmaster Sang Lee, opened his first school in Binghamton, NY and we moved to Colorado Springs, CO in 1986 so he could train the US Olympic Taekwondo team for the 1988 Olympic Games. We currently have 4 locations in the area with approximately 1,000 students. 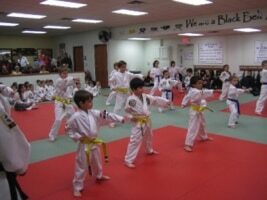 Our primary martial art is taekwondo, but in addition we also teach some hapkido, boxing, jujitsu and other arts in our programs. We teach students of all ages. Why did your father decide to open a martial arts school? 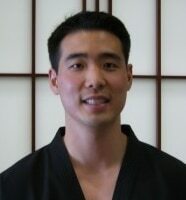 Grandmaster Lee grew up poor in Korea and used taekwondo to build his body, eventually earning a scholarship and becoming a 13-time national champion. He wanted to share his passion and give back to the sport that gave him so much opportunity, so he decided to come to the U.S. to teach and further the development of taekwondo in America. What does being a martial arts teacher mean to you? I feel the same way as my father, acknowledging that taekwondo gave our family a foundation for success in the U.S. The martial arts industry can provide both financially and personally. I feel indebted to taekwondo as it has helped me become who I am, and I recognize that it can have a profound impact on the lives of others. I want to continue to grow the sport and build upon my fathers legacy of furthering the advancement of taekwondo in the U.S. I also enjoy giving back to our community and making a difference in peoples lives, and I like being able to do that with taekwondo. The first challenge is staff development and retention, ensuring that we are challenging our instructors to become leaders and expand to new locations. Second is generating new enrollments and third is student retention and promotion. I am the secretary for the Korean and American Martial Arts Association (KAMA) and I met a representative from Kicksite at one of our events. I also received a good referral about the software from a colleague and decided to take a closer look at the system about 2 years ago. I had been using another computer-based system for about 7 years, but I needed an Internet-based management software that would allow me to access school information outside the school. Kicksite offered just what I needed, and combined with good feedback from others I decided to give Kicksite a try. How has Kicksite helped you run your business? I think Kicksite is very good at managing attendance and student updates to help our staff keep up with our students. But Ill be the first to admit that Im not using Kicksite to its full potential, as there are other features Id like to learn to use more effectively including the messaging and social media functions. Yes, but I dont have any specific numbers. But we are considering opening a fifth location. I think that Kicksite will continue to help us keep a pulse on our students and communicate with them better. Continuing to improve our customer experience, grow and develop our student body and expand to future locations. Being in a military community, theres always a challenge of retention. The economy can also have an impact, but as long as we are focused on doing what we do best, which is helping strengthen families and developing values, I think people will continue to invest in our product. We have been doing this for 27 years. We had a student try to develop a database for us about 15 years ago, and my suggestion is Dont try to reinvent the wheel. If you want to run your school professionally, I think its vital to have a reliable student management software and go with a professional company that is committed to developing and maintaining a top-quality product. Is there anything else you would like to say about the Kicksite system? developed software in-house, used another software system for years and looked at other systems…and I think Kicksite is the best one. For more information on U.S. Taekwondo Center, please visit their website or Facebook page or call 1-719-488-4321.